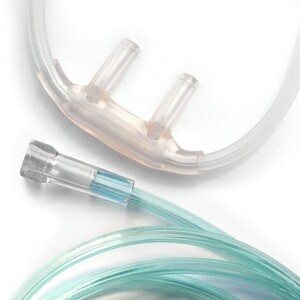 Comfort Soft Plus cannula nasal prongs are slightly curved to enhance and promote proper alignment on the face; and the included 25 foot tube is green for increased visibility and safety when in use. Great product - was as advertised- Quick delivery- What else would customer want? Highly recommend these people to do business with. I like the soft tubing, there is one thing it always twist around and I have to untwist. The cannula itself may have been okay but the material that they made it out of had a horrible odor! I tried using it but after one day I had to throw it out. However, Direct Home Medical is great, I will continue to purchase from them, just not this particular product. What can I say? Fast shipping, trusted source for buying and quality products. Love that 25 ft. No tangling and enough to get me all through house. Thank you! First one I used had a leak where the nasal part attached to the tube and nasal cannula left side broke off the connection rest so far so good. Just what I was looking for because of my need to use a nasal cannula 24 hours a day. Very comfortable. I was in pain from my tubing that came with my bipap. It was so stiff it was blisters under my nose. The soft tubing solved all that. I wish I knew about this earlier. The super soft is great in preventing nose bleeds and other nose problems. The length is great to use in a room or a RV. Use one in my 32 foot RV and the oxygen unit stays in one place and I can go anywhere in the RV. I opened up bag and hooked up lines and tried to breather WOW it smelled so bad I hooked up the old ones. I ordered 4 of them and they all smell just as bad. When you breath in what goes into your lungs is awful I couldn't get them off fast enough. Great product! This cannula doesn't seem to get as hard as fast as some others. No problem finding what I was looking for. Shipping was fast! Just what I was looking for! I use it with my portable concentrator in our 5th wheel camper trailer. Item shipped quickly and exactly what I ordered! I will be ordering from this company again! Easy to use website and the order was received before expected. These are perfect. Soft and comfortable. Worked great with my Inogen while on vacation. The best that we have tried so far. They are just perfect. My dad can walk all around his house and when they get stuck under is recliner mechanism, since the cost is so economical, we can easily replace. Always a pleasure to do business with. Best prices and free shipping. Thanks. Arrived as stated. Good quality. Will order again. Overall length, not 25 plus cannela.. I didn't think this one through. With the cannela built in overall length was 25'. Somehow I thought it would be 25' PLUS the 7' canella.. Oh well. It is still good quality and I will use it in the car on the portable just coiled up.. When I first plugged it into my oxygen Concentrator it smelled funny like moldy, and it was making me cough and wheeze. I thought I was not going to be able to use it but the smell is slowly getting less and less. I bought this for my Mom. She says it's much softer on her nose when sleeping. The cannula that was delivered with her oxygen was a hard plastic and very uncomfortable. Excellent product and IAW the descriptions. I really like the nasal probes on the WestMed's. They are longer and not as rigid as Salter. The big issue is there connection ends must be a bit larger than the Salter connectors and slip off the barbed supply of the swivel or concentrator connection. I ordered the oxygen tubing for my mother. It arrived quickly. Now she has a sotft tubing that is better than the hard one she had. Wonderful to have found this online. Thanks. I am pleasantly surprised by the fast service that I receive from DHM. I would also like to add that my nasal cannula's from DHM are the most confortable that I have found being as I am on oxygen 24/7. Loving the water is a challenge using oxygen. 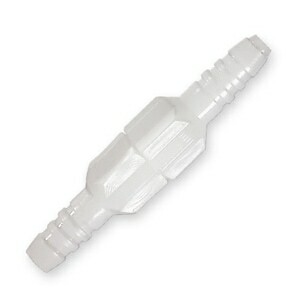 I use this cannula at the pool. It allows me good movement with my tank on the side of the pool. It comfortable and satisfying my desire to be as active as I can. This is the right length for my night time Oxygen concentrator. I was introduced to the WestMed SuperSoft / ComfortSoft Plus Nasal Cannula during a recent hospital stay. They were far superior to any I had previously used. Now that I know where I can get them I will never use any other brand. I am very happy with this tubing length as I do not get hung on everything in the house now. The piping is soft but when I opened the package one of the lines was not inserted in the tubing connection. I was out of town to all we could find was black tape to keep the tubing attached to the connection that the oxygen was coming from. Now I can't tighten under the chin so it comes off all the time. Disappointed in this product and now I have to order another. I like the fact that the nasal cannula was soft rubber that made it more comfortable to wear and sleep with. I am so pleased that this 25-foot cannula is available! With my shorter cannula, the connection to the lumen kept getting caught under almost everything, meaning that I would have to unhook it before I could move on further. This cannula gives me complete freedom of movement. I hooked this to a 14-foot lumen, which is also available from DirectHome Medical, and the combination is PERFECT. I'm so glad that I found this site and the oxygen supplies that make my life so much easier!! 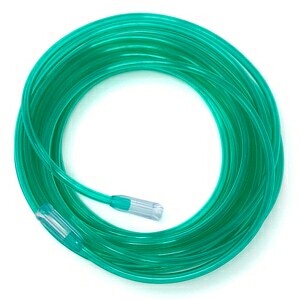 We ordered this 25 foot ComfortSoft Plus Cannula with 25 Ft Green Oxygen Supply tubing after using the 7 Ft Cannula. It's an excellent choice and works so well and is so comfortable on ears and around the face. Will continue to buy in the future. 25 ft tubing gives me moving about room when hooked up to my O2 concentrator. Direct Home ships fast and free.... excellent service! love the cannula. right after im done with this review im going to log onto the site and order 4 more so i dont have to worry about it when i need a new one.